"It ain't Bloody Rocket Science"
We opted for a Le Mans-style massed start. After much shoving the field headed into the dusty singletrack, soon dividing itself into "serious competitors" and "that'll never get down there!" racers. Chunkolini was the first to retire, following a near-duplicate of the notorious Jarod's Chopper Fiasco from CCI, the collapse of his long and unbraced chopper fork. 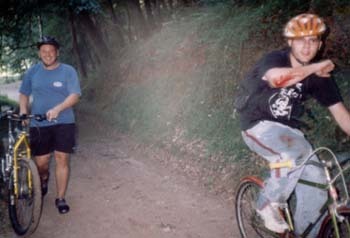 Jarod himself had clearly learnt from that incident, and had installed the front end off a motorcross bike onto a cheapo sus frame. 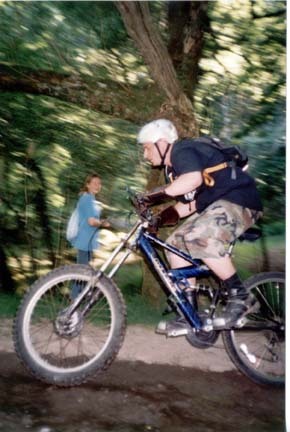 He crashed off down the hill in a contending position, payback for hours of pushing the weighty beast. Dan, the defending champion--who had cycled only five miles since last year's event--suffered a front flat in the rock gardens. He was soon passed by Dennis Thorne on a beach cruiser (with 20 inch wicker basket), Jerry on Klunker League Now's monster moto bike, Jarvis on a BMX and Shaggy on a Raleigh Bomber. There was only one good crash in the race: Chris's flying bellyflop down a six foot drop on to a rocky riverbed. I heard shouts from back up the trail and ran back up to see him sitting on the rocks claiming he was "OK" and we should all "race on dudes!". He blamed the endo on the brakes on his £1 Puch Calypso. Richard Vickery gets a honourable mention for racing the new Giant recumbent suspension commuter thing, complete with SPD sandals. He flatted but still went on to place near the front. I learnt that the crappy rod brakes on my postman's bike were useless when the first of the creek crossings washed the cola off the rims. (The cola was a desperate attempt to slow the rate of acceleration. I'd already given up hope of deceleration.) Next year I'm going to create a bike on which I can win, rather than just survive. The racers got a good cheer as they passed the spectators. A few miles of roller-coaster fireroads, more stream crossings and a foot-out corner into the high street bought most of us back to the finish line--the bar at The Ship. A trail of broken bikes marked the entrance for latecomers. 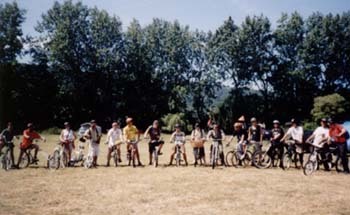 Back at the campsite, Dennis was handed the golden glitter 32 tooth medal on a chain for being world champion. He also won the communal prize stash, to which everyone had contributed, but then gave it all away--even the home-made carrot cake. Roly won the 63xc.com Magic Sprocket and certificate for best time on a fixed wheel (or nearest thing to it--he's a courier). Chunkolini won a nice sculpture--which he himself had made--for mechanical devolution. Jared won something because he's leaving us to go home to the states, I think it was for services (through lack of servicing) to the clunking world. 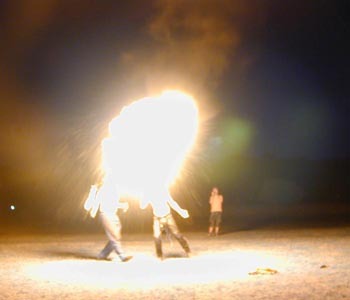 We were then treated to Jon and Tall Martin's insane display of mad northerners playing with fire. I've seen fire breathers before, but never with 20 foot towers of fire flying out of their mouths and arses. This was followed by the launch of the Bikehotrod Rocket Bike, complete with electric ignition, a rocket engine and a braking parachute. After that, it all went a bit hazy. ...everyone for being good sports, racing, drinking, crashing, lounging and burning. Thanks also to Gil the sticker man at Cycleshed, and to the locals for not calling the fire brigade. The Classic is ongoing, and details of the 2006 meet are here. Bike choppers? See the Bikehotrod Dark Starfish.